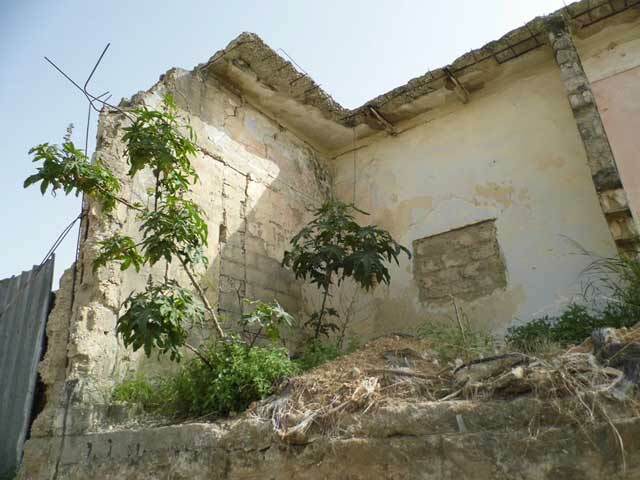 In March 2013, a salvage excavation was conducted on Eli Cohen Street in Ashqelon (Permit No. A-6751; map ref 160778–803/619850–70; Fig. 1), prior to paving an additional lane in the road. 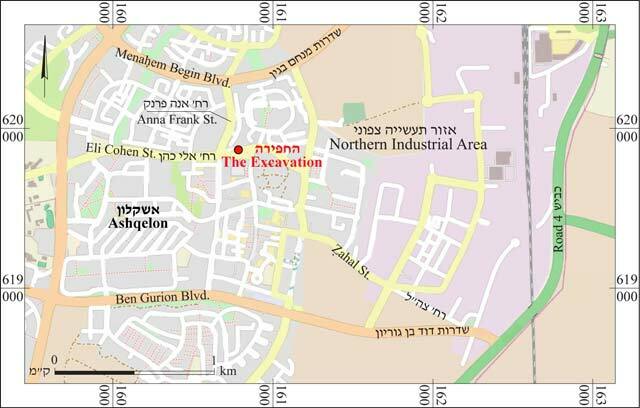 The excavation, undertaken on behalf of the Israel Antiquities Authority and financed by the Ashqelon Economic Company, was directed by I. Peretz (field photography), with the assistance of Y. El-‘Amor (administration), M. Kogan and A. Hajian (surveying and drafting), I. Lidski-Reznikov (drawing), C. Amit (studio photography), A. de Vincenz (ceramics; see Appendix) and Y. Arbel, L. Rauchberger and E. Stern (ceramics and clay tobacco pipes). Much help was provided by A. Sasson of the Ashkelon Academic College and Y. Gal’on, curator of the Ashkelon Museum. The excavation (27.5 sq m) was conducted in the Migdal neighborhood, c. 80 m northwest of the Khan Museum. The neighborhood’s name comes from the Arab town of el-Majdal, which was situated there until 1950. In excavations conducted west and northeast of the current excavation area the following antiquities were discovered: pottery sherds from the Chalcolithic period (Nahshoni 1999), Middle Bronze Age II tombs (Gershuny 1996; 1997), a decorated tomb dating to the Roman period (Kogan-Zehavi 1999), fill from the Hellenistic period, a winepress from the Byzantine period and architectural remains ascribed to the Byzantine and Early Islamic periods (Nahshoni 2009; Haimi 2009). In an aerial photograph taken in 1947, a cluster of buildings was identified near the excavation area, beside the northern margins of the road and not far from the Great Mosque. The easternmost building in the group is designated as esh-Sheikh ‘Ajam on a 1930 map (Sasson 2013:25), possibly indicating that it comprised a tomb, as described by longtime residents of the neighborhood (pers. comm.). The building in which the current excavation took place lay to the northwest of the easternmost building in the group. Before the road was paved, all that was preserved of this building was a southern room used for storage (L115); a northern room, of which only parts of the walls survived (L114; Fig. 2); and an eastern unit at a lower level, in which two rooms were preserved. Two excavation squares (Fig. 3) were opened, one in the building’s eastern unit (c. 17.5 sq m) and one north of the northern room (c. 10 sq m). The floors of the rooms also cleaned. Four construction phases (1–4), from the Late Ottoman period until the present, were identified. Phase 4. Wall sections, habitation levels and soil fills are ascribed to the earliest phase. The walls in this phase were built of two rows of roughly hewn kurkar stones with small stones in between bonded with brown earth. A wall (W8; length 4.85 m, width c. 0.6 m; Fig. 4), founded on a broad stone base and preserved to a height of 2.05 m, was exposed in the northern square. A wall (W7; width 0.55 m; Fig. 3: Section 1–1) abutted Wall 8 on the south. 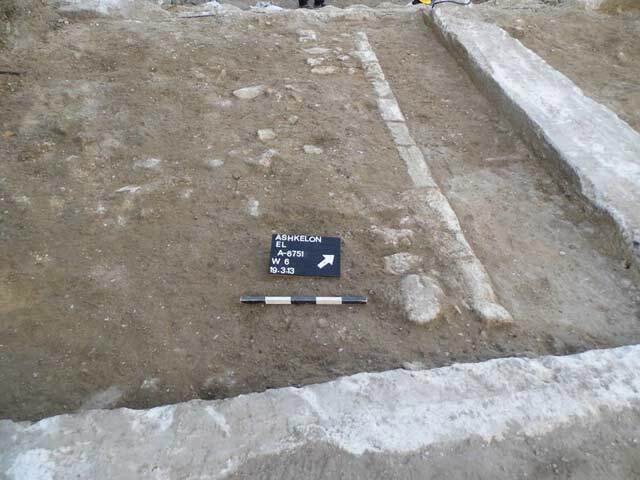 Upon completion of the excavation, a third wall (not marked on the plan) that abutted W8 from the north was exposed in the eastern section of the square. A row of stones that might have collapsed from this wall was discovered north of the eastern section. 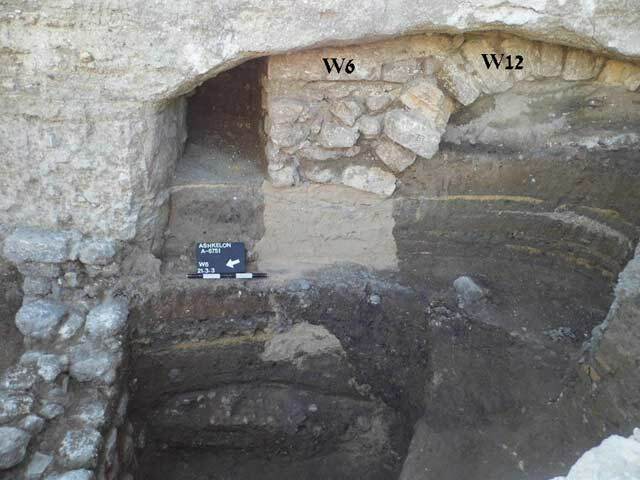 The foundation of W8 was exposed below a habitation level of orange-brown clay and very hard orange-brown soil (L124; Fig. 4). Orange-brown earthen fills mixed with small stones (L117, L123) was discovered above Level 124. Level 124 and the overlying soil fill contained fragments of a tabun or a large storage vessel made of coarse clay (Fig. 5:27); several fragments of Black Gaza Ware, including a bowl with a plain, upright rim adorned on the outside with a wavy decoration (Fig. 5:9); a krater made of brown clay, with a thickened and everted rim (Fig. 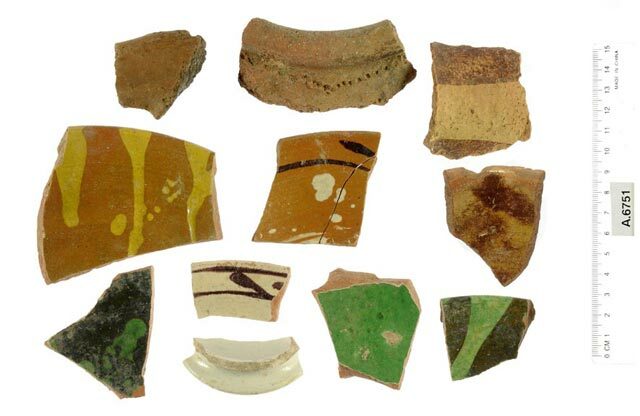 5:13); fragments of hand-made and glazed vessels, including part of a decorated cooking pot handle (Fig. 5:15; see Appendix); a handle of a burnished cooking pot (Fig. 5:16; see Appendix); an amphora made of pale yellow clay that has a gray core and a round everted rim (Fig. 5:17); a glazed jug rim imported from the south of France (Fig. 5:20; see Appendix); and a body sherd of a closed vessel made in the tradition of Mamluk-period pottery vessels (Fig. 5:22; see Appendix). The ceramic finds on Level 124 and in the overlying soil fills date to the Late Ottoman period (nineteenth century CE; see Appendix). Another habitation level (L128), at a higher elevation than Level 124, probably abutted Wall 8 as well. This level was a thin layer of gray soil mixed with ash. A section of another wall (W11), possibly part of an installation that delimited a large stone vessel (Figs. 6; 7:7) was exposed in Level 128. A fill of black soil mixed with stones (L116) was discovered above Level 128. Fill 116 and Level 128 were disturbed by modern-day work. A layer of ash (L111; Fig. 3: Section 1–1) discovered east of W7 should also be ascribed to Phase 4. The ash layer covered a level of orange-brown mortar that is higher than Level 124; this may indicate that the floors were raised. The finds discovered in Level 128 and Fill 126 included numerous fragments of Black Gaza Ware, including jars (Fig. 5:18, 19) that are a sub-type of a water jar known as a jara (Israel 2007:86–108), as well as two loom weights, one made of clay (Fig. 7:5) and the other of marble (Fig. 7:6). These weights are probably related to a developed textile industry at el-Majdal (Sasson 2001:108–109). A wall (W10; length 2.25 m, width c. 0.6 m; Fig. 8) built along an east–west axis and scant remains of another wall (W12) were exposed in the western square. A pit (L126) containing shiny black ash was revealed north of W10. The pit severed an ash level mixed with sand (L118) that covered a level of orange-brown mortar (L125), possibly a floor. A modern refuse pit (L113; Stratum 1, below) disturbed the upper part of the levels. South of W10 was a similar level of ash mixed with sand (L119), and below it was a level of orange-brown mortar (L120). The finds from Levels 118–120 and 126 are similar to those found in Pit 126. They include numerous pottery sherds, such as bowls imported from Turkey and Greece (Fig. 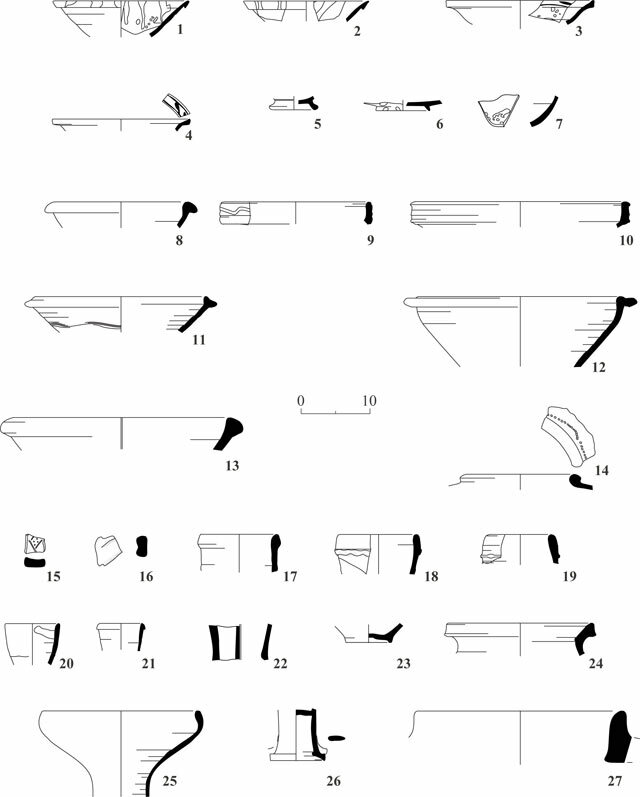 5:1–4, 6, 7; see Appendix) dating to the late eighteenth or early nineteenth century CE (Bowl 3), to the nineteenth century (Bowl 4) and to the late nineteenth century and early twentieth century (Bowls 1 and 2); a variety of Black Gaza Ware bowls and kraters, including a zavdiya-type bowl (Fig. 5:8; Israel 2007:208–209), a carinated zavdiya bowl with a rounded and slightly everted rim (Fig. 5:10), kraters used for kneading dough (Fig. 5:11, 12), known as masharat or ‘arabe and made of gray clay which have a double stepped-rim and date to 1700–1900 CE (Israel 2007:186–193), one of which (11) is decorated with delicate combing; a cooking pot made of coarse pink–light brown clay containing numerous quartz particles and white inclusions with a thickened and rounded rim and a low neck (Fig. 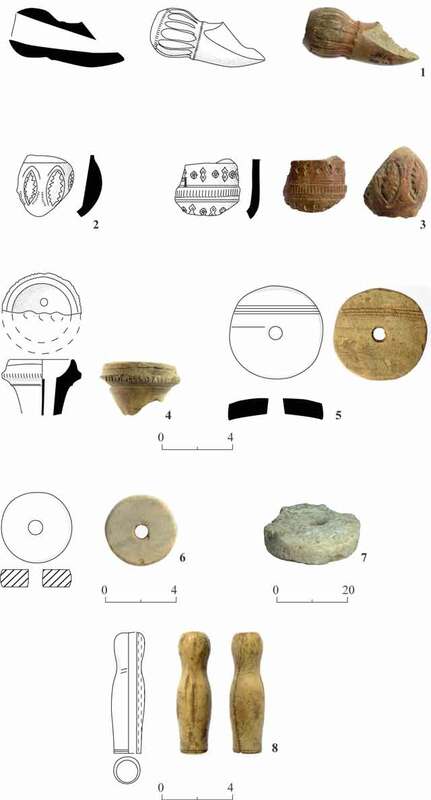 5:14); many fragments of Black Gaza jars (jarot) similar to those discovered in the northern square (not illustrated; see Fig. 5:18, 19); as well as a fragment of an abriq jug (brik; Fig. 5:21), a ring base probably belonging to a jug or teapot (Fig. 5:23), a storage vessel known as a hideriya (Fig. 5:24; Israel 2007:237–239) that has a triangular and everted rim and a thin ridge on its base, a funnel made of red–brown clay and a gray core with white inclusions (Fig. 6:25), which has a plain inverted rim and long straight neck, and a fragment of a red burnished tobacco pipe (Fig. 7:3; see Appendix). Phase 3. A wall (W6; preserved length 3.55 m, width 0.6 m; Fig. 9) built of two rows of kurkar with a core of small stones bonded in brown mortar is ascribed to this stratum; the northern, outer face of the wall was built of well-dressed stones. A vault (W12; Fig. 10) was incorporated in the western end of the wall, and together they formed a corner. The vault was founded on a robber trench filled with sand and was built of roughly hewn kurkar stones. It seems that the vault severed fills and levels that predated its construction. 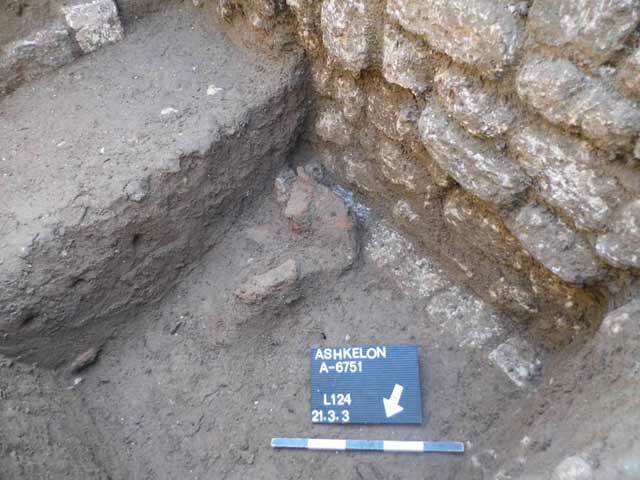 Soil fill (L102, L107) discovered on either side of the vault yielded pottery sherds that include LRC bowls from the Byzantine period (not drawn) and a tobacco pipe dating to the Late Ottoman period (second half of the nineteenth century; Fig. 7:1; see Appendix). The base of a cup imported from France, common from the eighteenth century (Fig. 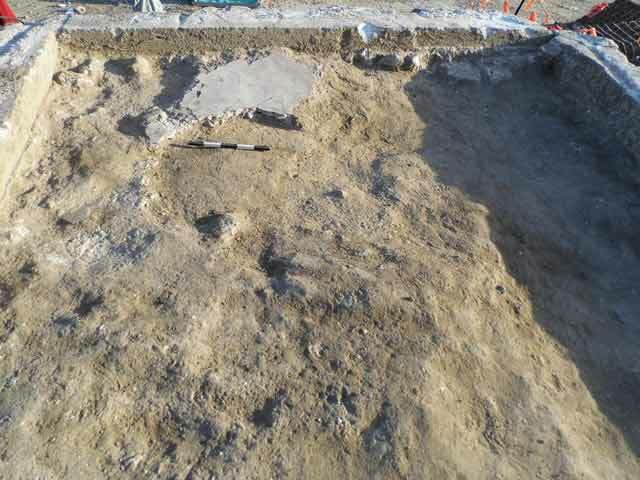 5:5; see Appendix), was among the artifacts discovered in a soil fill below the vault from Phase 2 (L103; below) in the north of the excavation area. Another wall (W5) built of various-sized kurkar stones and preserved to a height of 0.86 m may also be ascribed to this phase. Its orientation differed from that of W6 and Vault 12. It seems that in Phases 3 and 4 there were several sub-phases, manifested by raised floors, for example Ash Level 111, but it is difficult to ascribe them to a particular period of time on the basis of the finds. The finds in Phases 3 and 4 range in date from the late eighteenth century or early nineteenth century until the 1930s or 1940s. Phase 2. 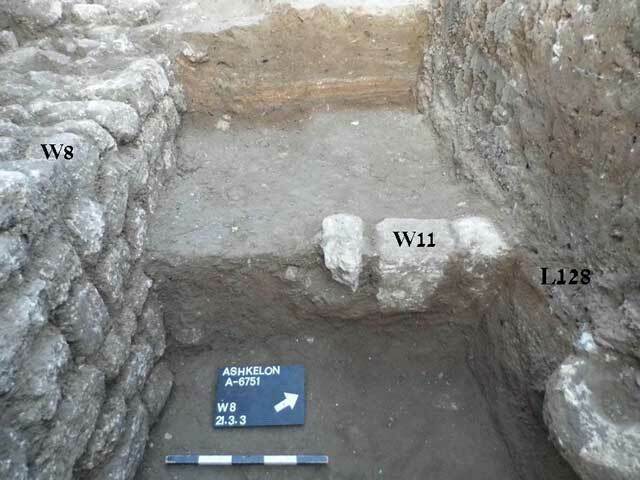 Some of the walls of the building, where the two rooms (L114, L115) were located, were preserved on the surface prior to the excavation. During the excavation the building’s foundations were exposed which were not symmetric (W1–W3; length 7.40–7.95 m, width 4.85 m); they were constructed of vaults (L102–L104) and concrete beams reinforced with iron. Wall 2 was built next to W8 of Phase 4 and canceled W7 of Phase 4. Wall 1 was built on W10 of Phase 4 and canceled it. In W1, south of Vault 103, there were remains of a pillar built of concrete and stones; it may be indicative of another vault that was in the building but did not survive. A wall (W9) that separated the two rooms was discovered inside the building. Room 114 was paved with a red painted concrete surface (Fig. 11). A floor bed made of concrete, stones and sand that covered W6 of Phase 3 was revealed in Room 115. Due to later disturbances in the area the building cannot be dated on the basis of the finds, but by comparing it with aerial photographs and maps of el-Majdal from the British Mandate and on the basis of the building materials, it seems it was constructed between the 1930s and the late 1940s (Sasson 2001:102). The building continued to be used by local residents until its northern part was demolished in the 1980s (Sasson 2013:47). Following the departure of the Arab inhabitants of el-Majdal, a synagogue for Libyan Jews was built southwest of the building; it is still in use today. Phase 1. Refuse pits (L112, L113) and a modern gravel parking lot (L100) were discovered in the excavation area. The base of a vessel that was probably a ceramic oil lamp (Fig. 5:26) and a worked bone fragment of a narghile that probably connected the water bottle with the narghile pipe (Fig. 7:8; see Appendix) were discovered above W7. A fragment of a tobacco pipe from the late eighteenth–early nineteenth century CE (Fig. 7:2) was discovered in Refuse Pit 112 above Fill 116. A ceramic fragment from the top of a narghile (Fig. 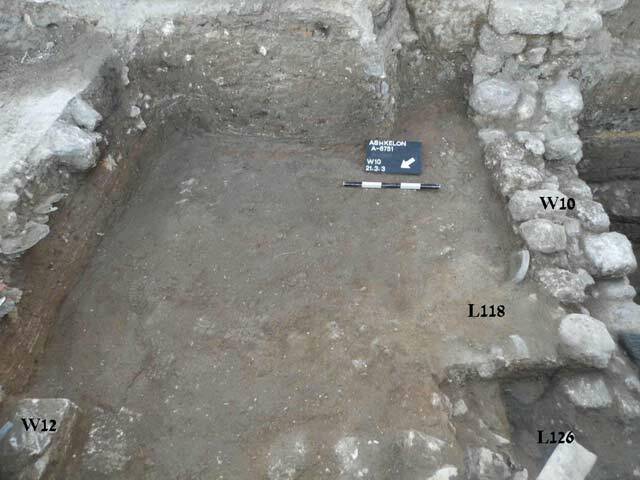 7:4; see Appendix) was found on the surface in the western square (L100). The importance of the excavation lies in it being the first excavation where building remains dating from the Ottoman period and the British Mandate (late eighteenth–early nineteenth century to 1948) were exposed in el-Majdal. Presumably, the architectural remains that were uncovered are part of dwellings; they underwent changes over the years, in which the open areas between the houses, possibly inner courtyards, were reduced, and the construction material changed from kurkar to silicate blocks (Sasson 2001:102) set on concrete foundations reinforced with iron. The finds from the Ottoman period included local vessels, as well as glazed bowls from Turkey, Greece and even France (Fig. 12), indicating the population in el-Majdal and probably throughout the south of the country used imported products in this period. For the first time in an excavation evidence was discovered of the weaving industry at el-Majdal in the Ottoman period and British Mandate, in which loom weights fashioned from ceramic and ancient marble items were used. Gershuny L. 1996. Migdal Ashkelon. ESI 15:131–132. Gershuny L. 1997. Ashkelon, Migdal North. ESI 16:141. Israel Y. 2007. The Black Gaza Ware from the Ottoman Period. Ph.D. diss., Ben-Gurion University of the Negev. Be’er Sheva‘ (Hebrew). Nahshoni P. 2009. Ashqelon. HA-ESI 121. Sasson A. 2001. Development of the Ashkelon Landscape and Surroundings in the Late Ottoman Period. In A. Sasson, Z. Safrai and N. Sagiv eds. Ashkelon, Bride of the South: Studies in the History of Ashkelon from the Middle Ages to the End of the Twentieth Century. Tel Aviv (Hebrew). 2. Remains of the northern room in the building, looking southeast. 4. Wall 8 and Habitation Level 124, looking south. 6. Walls 8 and 11, and a stone object on Level 128, looking west. 7. Tobacco pipes, a stone vessel and a bone item. 8. Walls 8 and 12, looking east. 9. Wall 6, looking west. 10. Vault 103 in Wall 6, looking east. 11. The floor of Room 114, looking north. 12. Glazed and decorated pottery.